President Ram Nath Kovind has announced names of recipients of year 2018 Padma awards viz. Padma Vibhushan, Padma Bhushan and Padma Shri. He approved conferment of Padma Awards on 85 persons. 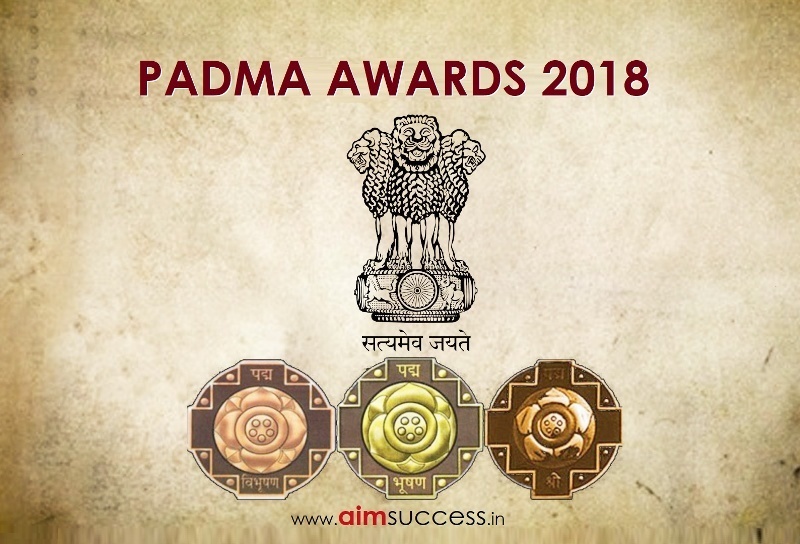 Padma Awards, the country’s highest civilian awards bestowed for distinguished service of high order in various disciplines- art, social work, public affairs, science and engineering, trade and industry, medicine, literature and education, sports, civil service, etc. The 2018 list includes 3 Padma Vibhushan, 9 Padma Bhushan and 73 Padma Shri Awardees. 14 awardees are women, 16 awardees are from category of foreigners, NRIs, PIOs while 3 are posthumous awardees. The list also includes unsung persons and also people who rendered selfless service at the grassroots. It is the second highest civilian award. It is the third highest civilian award. It is the fourth highest civilian award.